THIS STUNNING NEW VERSION OF A CLASSIC IS THE BEST WAY TO ENTER WONDERLAND . . . WITHOUT ACTUALLY FALLING DOWN THE RABBIT HOLE. Alice in Wonderland is one of the most wondrous, truly original stories ever written—filled with magical and marvelous happenings. 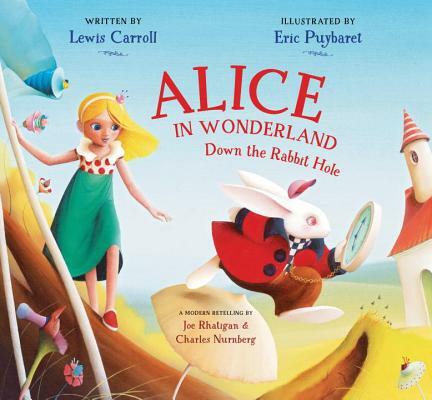 On its 150th anniversary in 2015, Lewis Carroll’s tale of a world gone topsy-turvy gets a unique picture-book retelling of the beginning of Alice’s journey, with elegantly simplified text that keeps all of the astonishing adventures and wide-eyed amazement of the original. What a wonderful Introduction for young children to many of the classic Carroll characters - Alice and The White Rabbit, the Blue Caterpillar, Bill the Lizard and more. Many of the most famous phrases are here— like "Curiouser and curiouser" and "Oh dear, oh dear, I shall be too late" to prepare youngsters for the time they’re ready to read the whole book in its original form. Award-winning, bestselling artist Eric Puybaret creates an enchanting and magical Wonderland that looks like no other interpretation. Every spread in this magnificently produced volume is rich in charm, gloriously colorful, yet fresh and modern. From the extraordinary White Rabbit in his brilliantly red suit to the timelessly graceful young heroine, this is the Alice today’s young children can relate to. It’s the perfect, glorious introduction to a classic, a taste of what magic awaits them in the future. Charles Lutwidge Dodgson, better known by his pen name, Lewis Carroll, was an English writer, mathematician, logician, Anglican deacon and photographer. Joe Rhatigan has authored more than fifteen books for children and adults, including Don't Unravel When You Travel and Out-of-This-World Astronomy. He has also produced several best-selling books and series, including 101 Places You Gotta See Before You're 12!, The Boo Boo Book, and the My Very Favorite Art Book series. Joe has been a poet, a teacher, a marketing manager, and a newspaper boy. He lives in Asheville, North Carolina, with his wife and three children. Charles Nurnberg is the co-creator of this retelling of Lewis's classic. Charlie has been a publisher for over forty-five years. He has worked with many acclaimed authors and helped create many wonderful books including Puff, the Magic Dragon, Over the Rainbow and The Night Before Christmas. Eric Puybaret is the best-selling illustrator of Puff, the Magic Dragon, The Night Before Christmas, Over the Rainbow, It’s Raining, It’s Pouring, as well as numerous books in his native France. His art, has been called "elegantly rendered," by the New York Times; "graceful [and] whimsical," by Publishers Weekly; and "lovely…and indeed magical," by Kirkus Reviews. "A much-abridged version of the classic's first five chapters, dressed up with large and properly surreal illustrations." "Puybaret’s colorful acrylic paintings emit a glow of whimsy perfectly suited for Alice’s journey. A Wonderland map, reminiscent of a Candy Land board, graces the end papers. Though lacking the wordplay and darkness of the original Alice’s Adventures in Wonderland, this simplified rendition will nevertheless fill young readers with wonder." This much-pared-down picture book adaption takes a modern-looking heroine down the rabbit hole and through the first five chapters of Carroll's classic tale. Though some of the original dialogue is retained, the story is told in updated narration. The paintings create a dreamlike reality, depicting the creatures and landscapes of Wonderland with warm-hued brushstroked backgrounds, clean lines, unexpected color choices, and whimsical details. The playful use of shadow and perspective emphasize Alice's size shifts, as she consumes edibles that make her stature fluctuate between tiny and tremendous, treks through a river of her own tears, and, with the advice of a Blue Caterpillar, finally nibbles a mushroom and returns "to the right size. Phew!" The action abruptly ends there, with Alice pondering how to get home (and the tea party beckoning in the distance). VERDICT While some moments of the story are effectively depicted, the whirlwind pace covers too much territory too quickly, making it difficult to follow for those unfamiliar with the tale.